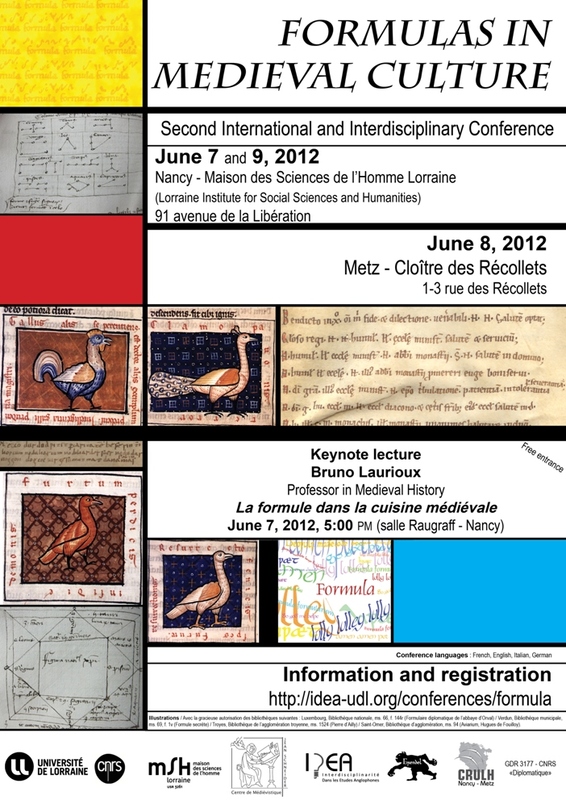 The Centre de Médiévistique Jean Schneider (ERL 7229), the Centre de Recherches Universitaire Lorrain d’Histoire, Metz (EA 3945) and the medievalists from IDEA are hosting the second edition of an international and interdisciplinary conference on Formulas in Medieval Culture. Among the issues raised by the conference is that of the reception of formulas: does the repeated use of conventional formulas end up depriving them of their original meaning, turning them into pure discursive markers or does it enrich them with the added connotations of multiple contexts? One should also be careful to define the phenomenon precisely: what distinguishes a formula from a mere motif? from intertextuality? The keynote speech will be given by Bruno Laurioux, Professor at the University of Saint-Quentin-en-Yvelines, who will speak on Formulas in medieval cooking. It is now too late to submit an abstract, but the programme is available here and you can register here.